This is a functional nocturnal coin which you can actually use to tell time during the night and get your latitudinal deviation. 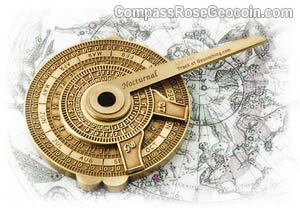 The nocturnal navigational tool stood the test of time. 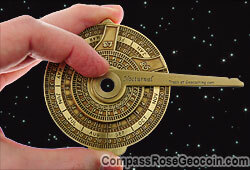 Its purpose is to tell time at night so you can gain a more accurate latitude and longitude reading. 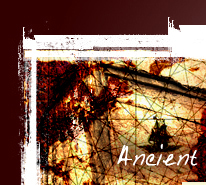 The first written evidence of a nocturnal was discovered in the year 1272. It was refined in the 1500s to tell more accurate time and was used well in to the late 1800s and partially used into the early 1900s. Two disadvantages of the Nocturnal is it can only be used at night, and only when the pole star Polaris and either of the dippers are visible. 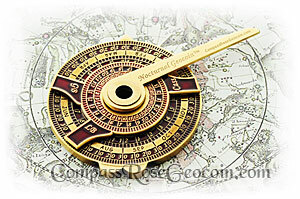 However, it also had a great advantage since it can be used at night when a sundial could not be used. The nocturnal can only be used in the northern hemisphere unless you know how to triangulate the southern axis point, but the deviation scales can only be used in the Northern Hemisphere. Using a nocturnal in conjunction with a quadrant will yield a more accurate latitude reading. 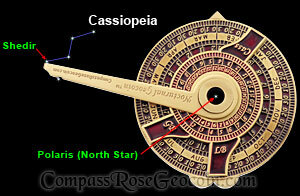 The use of a planisphere is most helpful to find the correct stars to use. Even though mechanical clocks have been around for several centuries, they could not keep accurate time on a ship that is pitching and rolling on the ocean waves. When an accurate chronometer good enough to be used at sea was invented and after it was able to be massed produced is when the nocturnal finally became obsolete. 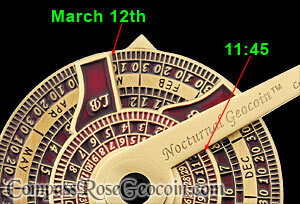 More sophisticated nocturnals also listed tide charts and deviation gauges on its surfaces. The early nocturnals were made of wood and later made in brass. They were approximately 7" to 10" in diameter plus the length of the handle and arm. The large circle, that has the handle attached to it, lists the days and months. The center rotating disk has the time. The arm has a notch on one edge so you know to use the opposite edge for lining it up with the stars. Both the center circle (time ring) and arm rotate on an arbor which is hollowed out to use it as a sight. 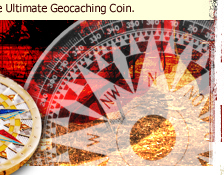 The Nocturnal Geocoin™ is trackable on Geocaching.com and has its own icon. It is available in both antique silver and antique bronze, and is specially designed to be held comfortably between your fingers when taking a reading. These are pictures of the current versions using translucent colors. 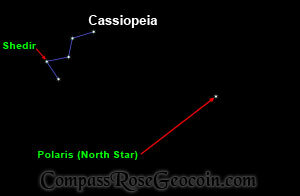 The current version has three tabs so you can read time from the Big Dipper, Little Dipper, and Cassiopeia constellations. The original versions (no longer available) are pictured below. They have two tabs for the Big Dipper and Little Dipper constellations. 1. You will have to wait until it is night time. I know you are eager to put this coin into use, but trust me when I say it is worth the wait. 2. 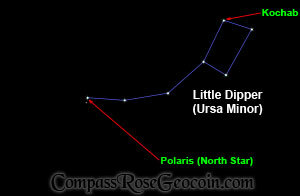 Determine which of the dipper constellations you will use to take your reading. 3. 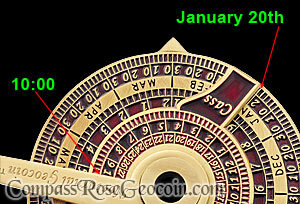 Then choose the corresponding tab on the time disk and align it with the current date. 4. Keep the time disk side of the coin facing towards you and hold the coin upright so that the top point of the coin is directly up and the bottom indention is centered directly down. A more accurate reading will be achieved if you ensure to do this. There are several ways to hold this coin; however, one way we found to be very effective is to place your middle finger on the top point, and place your thumb on the bottom indention. This automatically causes your hand to naturally vertically center the top and bottom of coin. Then by placing your index finger over both the time disk and the edge of the arm will prevent the pieces from moving out of adjustment once you have the moving pieces set. 5. 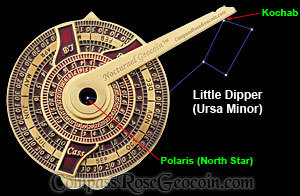 Hold the hole of the coin close to your eye and center Polaris in it. It is more effective to keep both eyes open. 6. Then move the coin a few inches straight out from your eye while keeping Polaris centered in the hole. 7. Once you find the correct distance from your eye, align the un-notched edge of the arm with the corresponding stars in the dipper you had previously chosen (Kochab in the Litter Dipper, the pointer stars in the Big Dipper, and Shedir in Cassiopeia). 8. Once set, ensure the time disk and arm do not move. 10. If you know the time of your port of departure, then you can use the time reading to ensure you are keeping within the same longitude. 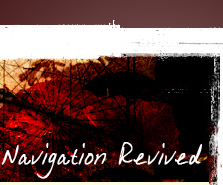 Once you get too far to the east or west of your departure point, then the longitude calculations become inaccurate. As opposed to the nocturnal, the chronometer is the device which allowed accurate longitude readings at any point on earth. 11. The back of the coin is used to calculate latitude deviation and is scaled in minutes. 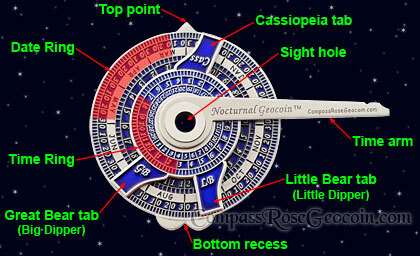 You take readings with it in the same way as the time side of the nocturnal: hold the nocturnal so that the deviation scale is facing you; rotate the arm to one of the dipper constellations; then subtract or add the corresponding number which the arm references to from the latitude reading you took with your quadrant. For example: if your quadrant reads 35 degrees and the deviation of the nocturnal reads -23, then your latitude is approximately 34 degrees and 37 minutes. 1. While this coin is only 3" in diameter, it is pretty accurate in relative comparison to a normal 8" diameter nocturnal. We tested it several times with several people, and it was normally within 15 minutes of the actual time. A normal size nocturnal would be within about 2 to 3 minutes. We did have it as much as 30 minutes off, but this occurred in about only 8% of the tests. 2. Because this coin is much smaller than a real nocturnal (the main disk is 3" tall), you have to hold it closer to your eye. Holding it this close will cause the edge of the arm to look fuzzy. You will have to take several readings and learn to determine where in that fuzzy portion you should align the big and little dipper stars. Another option is to add an extension to the arm. This is very easy by taping a business card edge to the arm lining up the edges and having the card extend further out thereby extending the arm by a few inches. Then you can hold the nocturnal further away and have a more solid edge to line up the stars. We did not make the arm any longer than it is to keep the cost of the nocturnal from being too high to the customer, but we did make the hole big enough so you can still see Polaris using the extension method. 3. This coin may consistently read farther off than you expect from the time displayed on your clock. If this occurs, then you may need to consider where in a time zone you are located. The nocturnal gives your actual local time for the longitude you are standing in, not clock time. Time zones can cover great distances from east to west, so there can be a considerable difference between actual time and clock time from one end of a time zone to the other. This coin is currently available for sale. You can make a purchase at the CoinsAndPins.com Navigation Geocoins page. The Compass Rose Geocoins® and Navigation Geocoins are manufactured and distributed by CoinsAndPins.com. You can also find them at some of our distributors' stores. 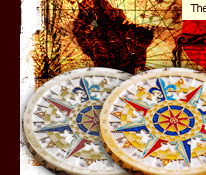 The Compass Rose Geocoin series is only available at certain times of the year. Join the CoinsAndPins.com mailing list to get notified of when sales are taking place. 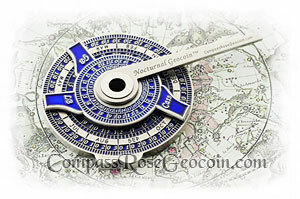 Compass Rose Geocoin is a registered trademark of Aaron Charles Promotions LLC, all rights reserved.